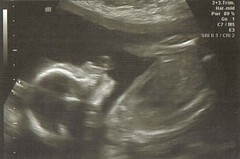 This is our wee Squiggle at 20 weeks!!! We had a cracking good long scan this time. It was a guy doing the scan for us this time and we both got the feeling he must be pretty new as he was ever so careful to explain everything to us, and check over ever last millimeter of Squiggles body in the finest of details. Squiggle is shy though, crossing his/her arms across their face so we couldn't see mouth, nose or eyes for ages! The guy had to jiggle my belly to try and wake baby up!! It was a miffed Squiggle who finally let us see that lovely little mouth. We got to see the heart in colour too, red and blue for the different chambers pumping away. Hubby was sent out right at the end so we could see if Squiggle is a boy or a girl.... but I should have known. Since letting us see his/her face was tricky enough there was no way this shy little baba was going to open it's legs for us! So we're staying Team Green for now. Jack was good as gold for his Nana out in the waiting room too. He had a good run about, but not anywhere he shouldn't, and then he settled on a couple of books and sat on Nanas knee to be read to. As we were in the next waiting room waiting for our scan piccy another couple asked if Jack was ours. They'd seen him with my mum before they came though and commented on what a lovely well behaved boy he was! How nice!